The fabric of Nature is bound together with fibers of all types. The very skin of the earth is a matrix of vegetation, animals, even the rocks and the soil are part of the complex series of interconnected fibers, holding things together. 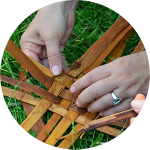 In this workshop participants will learn various methods of harvesting, preserving and preparing different types of natural fiber not only to wrap together and make cordage (rope), lashings, bow strings and thongs etc. but then also how to use that cordage to construct a variety of traditional containers, like collecting baskets or how to weave clothes. No experience necessary….simply the passion to learn! Space limited to 12 students so apply soon to ensure your spot. More information regarding directions and what to pack will be sent with your confirmation package.